Home » Current vs. Currant – What’s the Difference? Languages have so many words that some of them are bound to be similar. In English, words that sound alike but do not mean the same thing are called homophones. Homophones can be confusing, and in their misuse, hilarity sometimes ensues. If you write that someone was swept away by the currant and you aren’t relating a cautionary tale of drunken misadventure, then you had probably better read the rest of this article to find out why these words are different. What is the Difference Between Current and Currant? In this article, I will compare current vs. currant. As part of this comparison, I will use both words in a few example sentences to illustrate the proper context. Plus, I will demonstrate a useful trick that you can use to help you remember whether you mean current or currant. What does current mean? Current, the more common of the two words, can be an adjective or a noun. As an adjective, current refers to something that is in the present. Madison helped her daughter cut out newspaper articles for a current events project at her school. “The current situation is dire,” said the melodramatic official. As a noun, current refers to the movement of a running body of water or flowing electricity. The word also has a metaphorical sense, in which it can refer to anything that flows, like a conversation or a steady influx of money. Riley tried to swim back to Noah, but the current swept her away and she was never seen again. Apple rode the fast current of iPhone sales to new smartphone profit records. What does currant mean? A currant is a small, seedless fruit. Currants are a popular cooking ingredient and can also be used to make wine. Dried currants sold in stores are usually Zante currants, which are small grapes rather than true currants. Chloe got drunk on red currant wine and sent her ex-boyfriend an embarrassing text message. Currants have been used for medicinal purposes throughout the world for several thousand years. Here is a helpful trick to remember currant vs. current. Both currant and current can be used as a noun, but only current is also an adjective. If you are trying to use the word as an adjective, then your choice is clear. Use current. Since both of these words can be used as a noun, the choice is more difficult. Remember that currant, spelled with an A, and it is something that you eat. Eat and currant both contain the letter A.
Additionally, current is spelled with an E, as is electricity. A current is a flow of electricity. Is it current of currant? 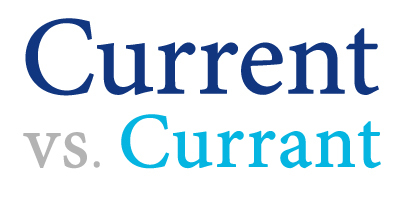 Current and currant are nouns, but only current is an adjective, as well. Since currant and eat are spelled with the letter A, you should have little trouble remembering the appropriate context for the word currant. Also, current and electricity are spelled with the letter E.
Current is the flow of a body of water or electricity, or an adjective meaning in the present. Currant is a type of berry. 1 What is the Difference Between Current and Currant?